« From $259,900! South Surrey ELGIN HOUSE at Harvard Gardens Condos by Polygon > 1 & 2 Bedroom Floor Plans Available! West Coquitlam Novella Condo Living! 77 boutique homes will be available at the luxury Novella Coquitlam condo project by Springbank Properties. 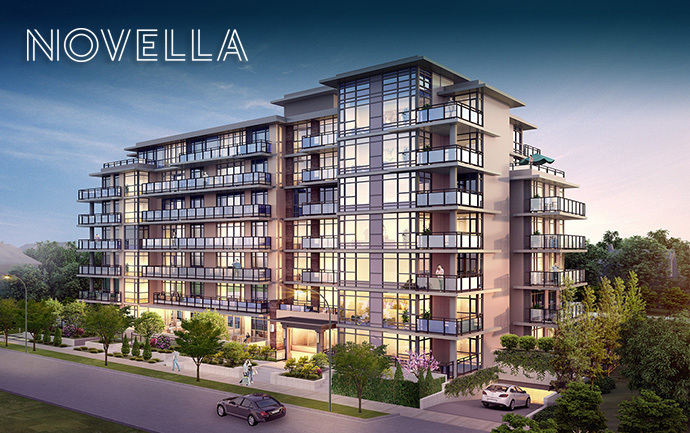 Coming Autumn 2014 to West Coquitlam real estate market, the Novella Condos are some of this years’ most exciting new homes to hit the property market in the Lower Mainland. Inspired by a collection of stories and truly unique in design, West Coquitlam Novella condos is a boutique concrete mid-rise built for the discerning home buyer. 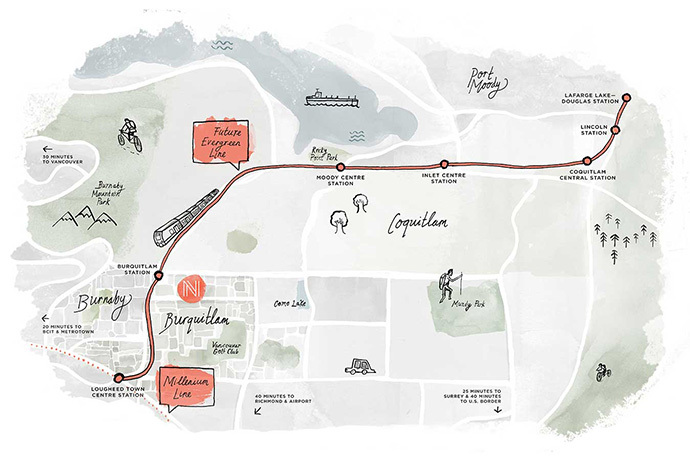 Perched on the edge of the urban centre and within walking distance from the new Evergreen SkyTrain Line, Novella Coquitlam presale condos will invite 77 new home buyers to select exclusively designed homes and for whatever your next story holds. The West Coquitlam Novella condo project is brought to you by Springbank Properties and Miller Wark. The architecture is by Rositch Hemphill Architects and the construction team is from Ventana Construction. The boutique interior design firm is Port+Quarter. You can pre-register your interest online at www.novellaliving.com today for upcoming release information in the Fall. Located just steps away from Burquitlam Park and the new SkyTrain Station on the Evergreen Line, Novella Coquitlam condos is a boutique concrete building with 1 to 2 bedroom plus den floor plans available. Early home buyers can also take advantage of some very limited opportunities to combine and convert suites into homes as large as 3 bedroom plus den residences. The project site for the West Coquitlam Novella condos is at Breslay Street and Langside Coquitlam. This is centrally located in the burgeoning Burquitlam neighbourhood (between Burnaby and Coquitlam) where you will find the future Burquitlam Station along the Evergreen SkyTrain Line just five minutes walk away from your front door through a peaceful greenway and across from a park. Some of the great amenities nearby include Burquitlam Plaza, Costco, H-Mart, Lougheed Town Centre and Northgate Village shopping. Top ranked schools nearby include Douglas Collage (David Lam Campus), Ecole Banting Middle School, Futurekids Daycare, Mountain View, Roy Stibbs and Vanier Elementary, Port Moody Secondary, Sunchildren Preschool and Simon Fraser University to name a few. The presales Burquitlam Novella Coquitlam condos are also close to many dining options that include White Spot, Joey Restaurant, Insadong Korean BBQ, Cumpari’s Gelato and Café as well as Bella Pizza. Great recreational options are also within a ten minute radius from the presales Coquitlam Novella Burquitlam condos including Steve Nash Fitness World, She’s Fit Gym, a proposed future YMCA location, Poirier Sports Complex and Community Centre in addition to the Burnaby Public Library and Cameron Recreation Complex. There is a wide range of draft floor plans launched for previews at the West Coquitlam Novella condo project that includes the one bedroom layouts (Atwood, Gibson and Bradbury) in addition to 1 bedroom plus den floorplans (including Conrad and Dickens). The spacious two bedroom suite plans at Novella Coquitlam presales includes the Eliot, Irving, Joyce, Kipling and Lawrence while the 2 bedroom plus den family sized residences include the Forster and Munro plans. Available only during presales at the West Coquitlam Novella condos are the First Edition Series floor plans. These 3 draft layouts include the Newbery (3 Bedrooms and 3 full bathrooms at 1444 square feet plus 180-320 square foot exterior), the Oates (3 Bedrooms plus Den and 2.5 bathrooms at 1513 square feet plus 165 sqft exterior over two balconies) and the Potter Novella Coquitlam floor plan at 1204 square feet plus 210-650 square foot exterior with 2 bedrooms plus den and 2 full bathrooms. Most draft Novella floor plans are online now at www.novellaliving.com/homes/ where you can download them as PDF documents onto your computer for reference. Some thoughtful interior details include open floor plans and large window walls that increase natural light and minimize hallway space. These are functional and efficient layouts for today’s urbanites. The new Novella Coquitlam condos also feature a Bespoke appliance package that includes a Bertazzoni range and Fisher & Paykel fridge/freezer. The storage spaces are very popular nowadays and the new Coquitlam condos at Novella Living do not disappoint with custom hidden kickplate drawers, pull out spice racks and built in space savers. As well, outdoor living in expansive patios and balconies are both private and comfortable. Some of the optional upgrades for Novella home buyers include a wine fridge, pull out or microwave hood fan and many others. Stay tuned for a full features list.